While The Initiation stands in a long line of made-to-order '80s slashers, few possess the same knack for its bold narrative and straightforward stalkings, all powered by a humble energy. Kelly Fairchild (Daphne Zuniga) has been troubled with a recurring nightmare. Kelly is a young girl. A stormy night. Her father. Her mother. Dolls. Stabbing her father. A stranger. Consumed in fire. What can it all mean? With the help of assistant teacher Peter Adams (James Read), Kelly begins a process of dream analysis...much to the alarmed displeasure of her mother Frances (Vera Miles). Is the nightmare simply a symbolic representation of emotion - or is it pure memory recall? Delta Rho Chi...never will die. Kelly and the other pledges of sorority house Delta Rho Chi are entering Hell Week, a test of their commitment and fidelity to their active sisters. As part of the finalization of Hell Week and the girls' initiation, the pledges must break into Kelly's father's mall (the Fairchild building) and steal the night guardman's uniform. The prank proceeds without a hitch. Kelly steals her father's keys and the three girls enter the deserted shopping center at night. Unbeknownst to them, Megan (Frances Peterson) and three male pranksters are also there...prepared to give Kelly and the other pledges a few scares in keeping with the tradition. But someone else is in the Fairchild mall...quietly...a stranger no one knows about, someone with a killer's vengeance. An intruder with no remorse. Is it a nameless, faceless psycho - or someone from Kelly's past, from her nightmare? The real ambrosia of The Initiation can be found once the pledges of Delta Rho Chi hit the dark hallways of the Fairchild mall. Death by arrow, a hatchet to the head, stabbings boomed live over the audio intercom...all part of the fun. Somehow, the self-confident revelation/climax of the film earns kudos by itself. 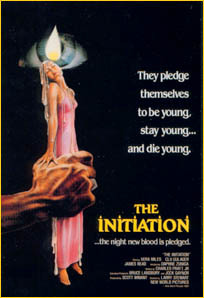 Without explanation and with no apologies, it's a standalone testament to the real reason audiences would enjoy the preceding events of The Initiation: the naive and honest atmosphere, the simply bloodletting. Certainly, The Initiation breaks no new ground. Sticking steadfastly to the formula of '80s slashers, the cards are held close, played out only when assured of a win. And therein lies its honest strength. Edgy innovation is clearly not the aim of The Initiation in the first place. Unabashedly unconcerned with redefining any horror conventions, the chief objective is a shopping cart of blood, off the rack and without designer labels. It wins.